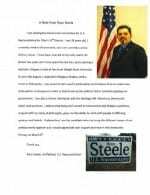 Website: www.steeleforrep.com as of today- the site is still a go-daddy holding page (March 2nd and it’s still a holding page). I updated this post on March 2 with his campaign literature at right which finally came out on March 1st- complete with a typo and no political disclaimer line. I also added the final candidates night video and a video I made with Ryan questioning Sharen Neuhardt about her real reasons for running and her answers. These are the videos from various candidates nights. Additional insight you will gain from watching them: he’s not a professional politician, he can think on his feet, he was a libertarian until he worked for DP&L for a year shutting peoples power off. His first job was given to him by current OH-73rd district rep Jarrod Martin- as an umpire in youth baseball, a job he has continued doing for 14 years. He is not taking donations bigger than $100 and hasn’t raised a lot of money. He has no signs, handouts, website (yet) and enjoys talking to groups of people. He has no health insurance, they have one car and that he and Laura are working on making a baby. Ryan got fired up at the Fayette County Dems Dinner and asked Sharen Neuhardt a direct question about her real reason for running and if blaming gerrymandering for her loss is appropriate. Ryan is in a 6 way race to run against Congressman Mike Turner in the newly redrawn OH-10 district that includes all of Montgomery and Greene Counties and the northern part of Fayette County. His opponents are David Esrati (author of this site and producer of all the videos), Olivia Freeman, Tom McMasters, Sharen Neuhardt and Mack Van Allen. You’re running for a public office but you can’t pay for things you purchase? You have owed me $250.00 for over 10 years for albums you purchased. How can you represent the State when you welch on deals? How much did you make on them. Either pay up (with interest) or give back the 100 albums and original posters you took from me. You were my office aide. I trusted you! @Penny Griffith- I take it you are addressing Ryan Steele, because I don’t know you. This is the site of David Esrati. I’ve said it before on this site- I think Ryan is a great addition to the ballot- and that I wish more young people would step outside their comfort zones to try to serve their country via elected office.